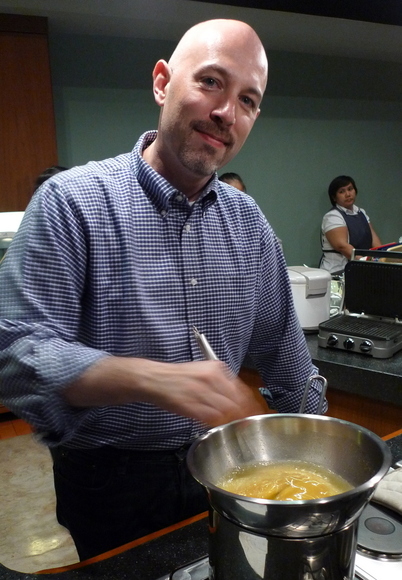 A year ago, my friend Nat and I cooked up a storm, preparing an 11-course “small plates” dinner for a dozen friends. While it was a success, we lost sight of the “small” part of small plates and halfway through the meal, everyone was thankful that one of our dessert courses had to be scrapped. It took twelve months, but we worked up the courage to try again and this time we stuck to the original intent, keeping portions very modest so that by meal’s end, everyone was satisfied but not stuffed. 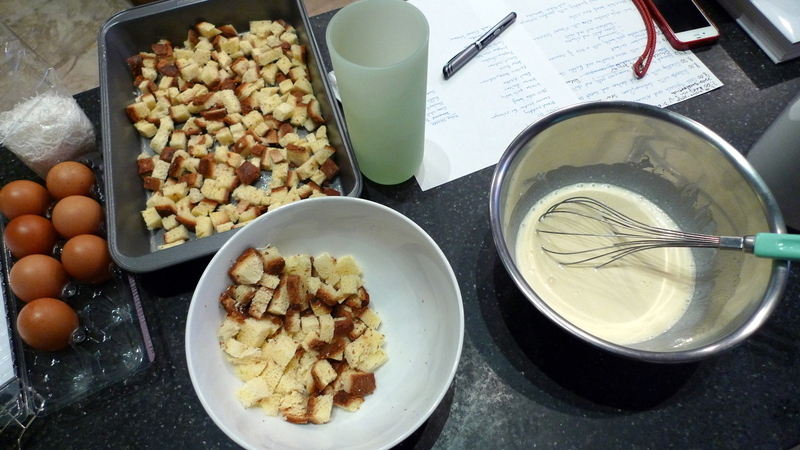 Left: preparing the bread pudding for dessert. Right: steeping pandan leaves in cream to infuse the flavor. 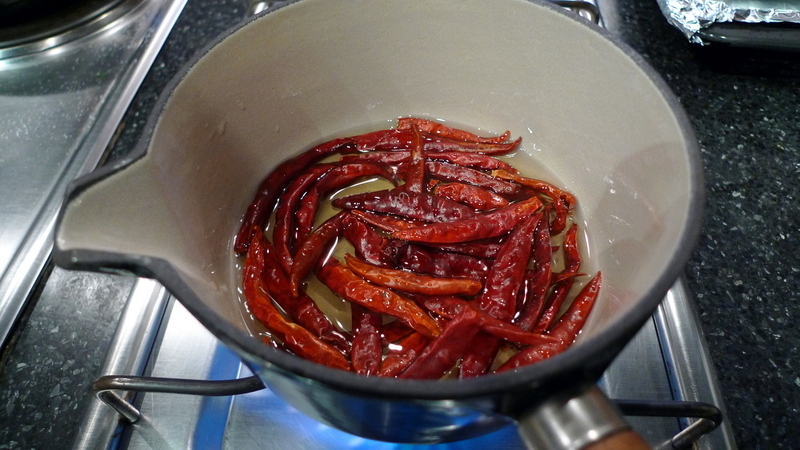 Left: making homemade chili oil as a garnish. 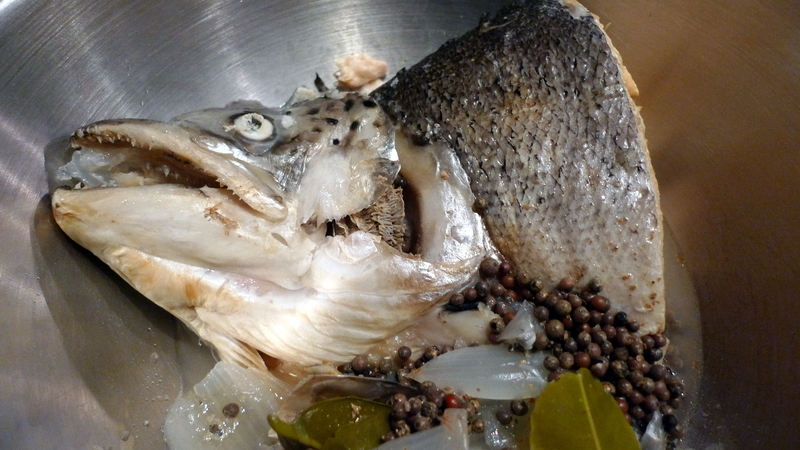 Right: the salmon head left over from making fish stock. 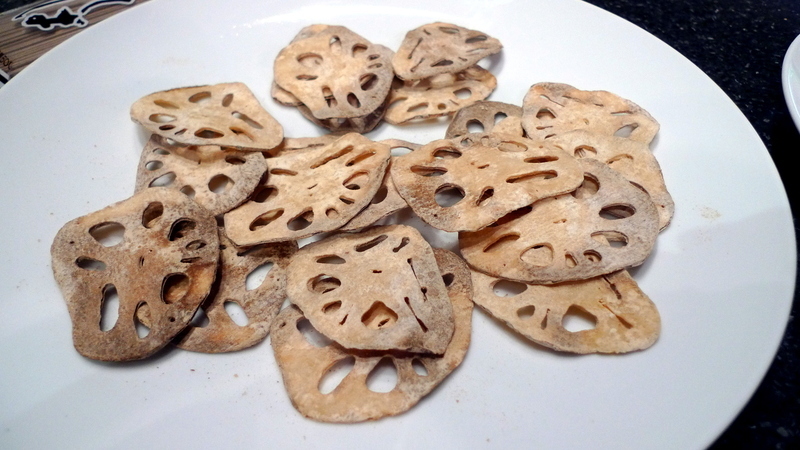 Left: lotus root chips cooked in the air fryer. Right: sauteeing rhubarb for a sauce. 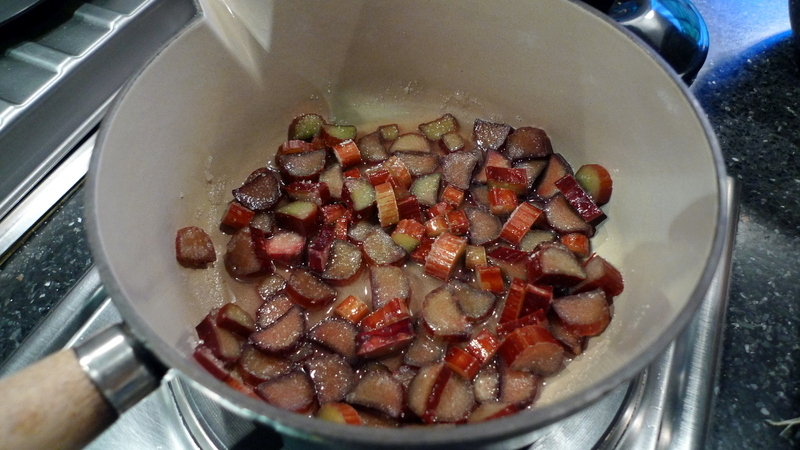 Left: braising daikon radish coins in a Indonesian sweet soy sauce. Right: testing the bread pudding. 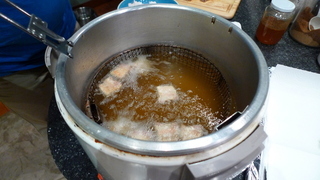 Left: deep frying the pieces of pork belly. 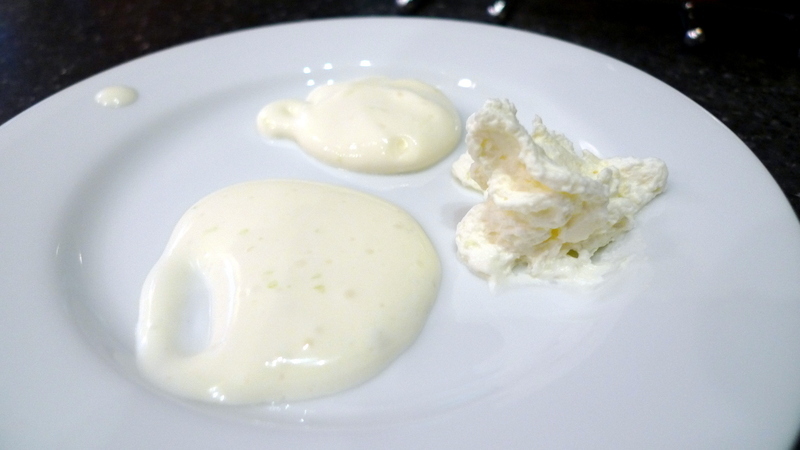 Right: testing different consistencies for the kaffir lime foam. Left: individual soba noodle nests. Right: sauces and plating notes for each course. After 7:00 pm, guests started to arrive and an hour later, with the help of Nat’s kitchen staff, we started to serve dinner. Here are the twelve courses. 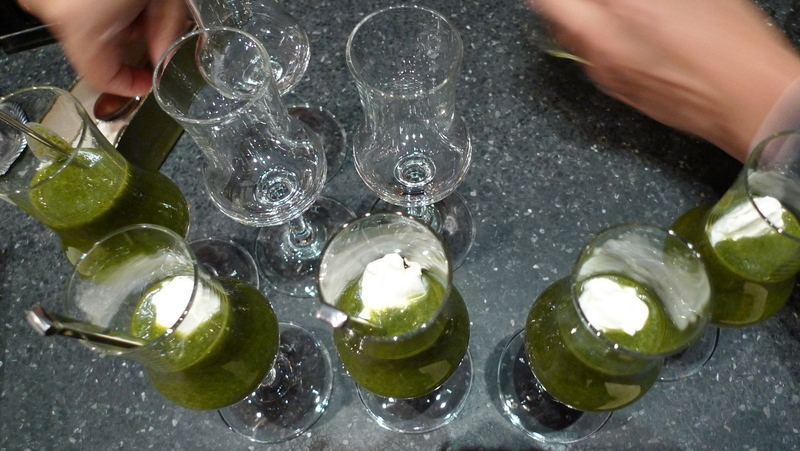 Spinach soup served with a garnish of creme fraiche. This soup had Indian spices and a bold, clean flavor. Made for a nice amuse bouche. 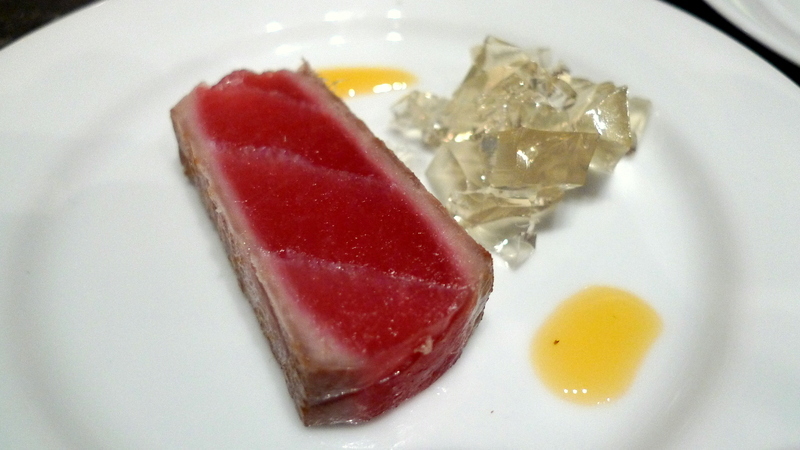 Seared tuna slice with lemongrass jelly and chili oil, both homemade. The initial batch of lemongrass jelly was too weak in flavor so I had to make a second, stronger batch about two hours before dinner. Thank goodness for Nat’s super-cooling refrigerator. I think a leaf or two of microgreens would have complemented the colors. 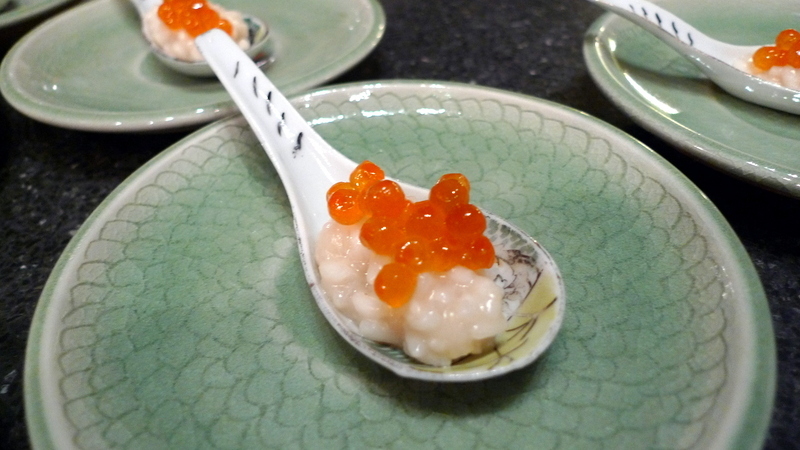 Third course was a very simple salmon stock risotto with salmon roe. Served as a single bite in order to keep servings small and allow our guests to enjoy a variety of flavors and textures throughout the evening. The next seafood course was a seared scallop (which didn’t get crispy enough as the surface wasn’t properly dried before frying) with a braised daikon radish coin served with kecap manis, a homemade Indonesian sweet soy sauce. 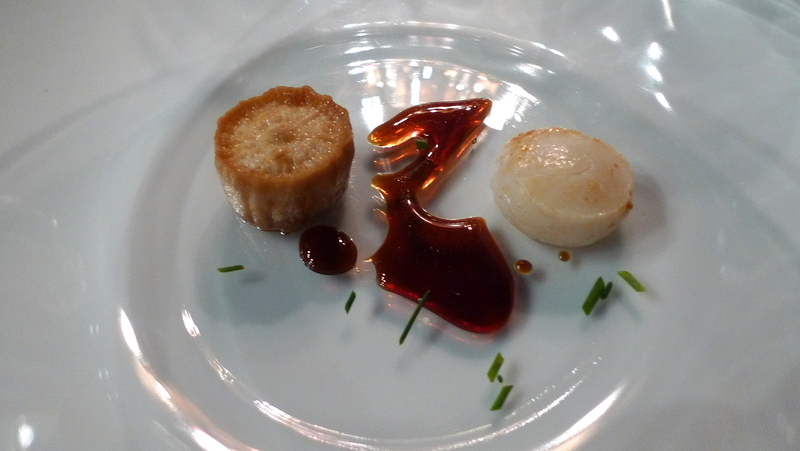 I liked the concept of this dish and wish I could have properly cooked the scallops and served the dish warm. 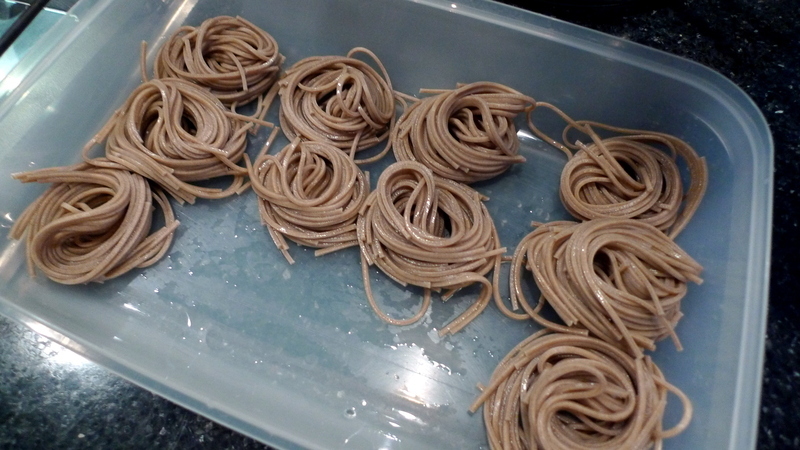 Unfortunately, we had no way to effectively warm the plates, so the sauce started to thicken and get sticky. Flavors were good, though. 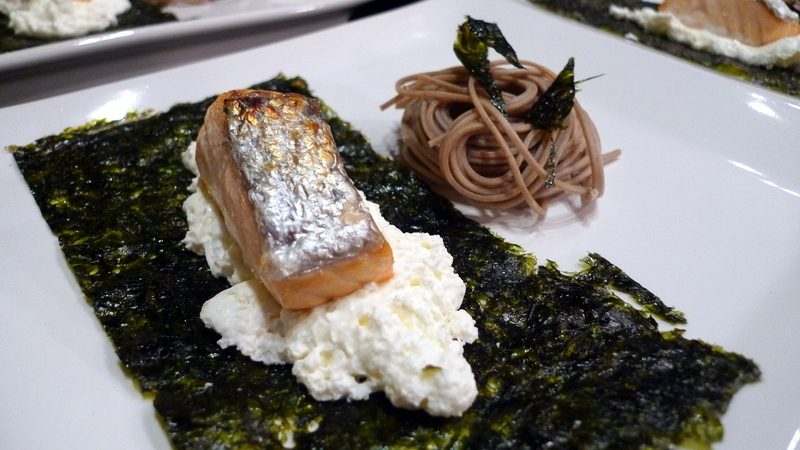 The final seafood dish was a slice of salmon, poached and then oven roasted, served with a nest of soba and a kaffir lime foam. Yes, I know that foams are so ten years ago but the flavor was interesting. Unfortunately, we got too much gas in the cannister and the cream came out like whipped cream rather than a true foam. We struggled with portion size here as I had to really twist Nat’s arm to convince him to cut the salmon this small – about two bites. He wanted to make it about twice as large. 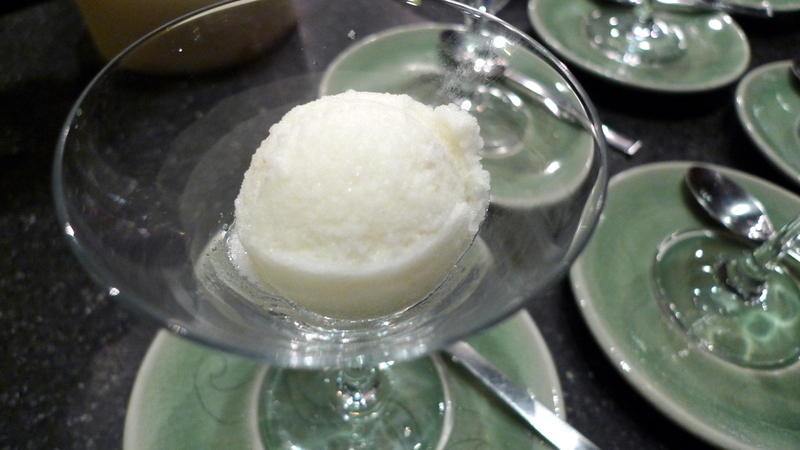 Mid-meal palate cleanser was a really pleasant cucumber gelato, the idea came from the dessert I had at Pollen in Singapore. We had to reduce the cucumber syrup by about two-thirds to sufficiently concentrate the flavor, but the results were worth it. 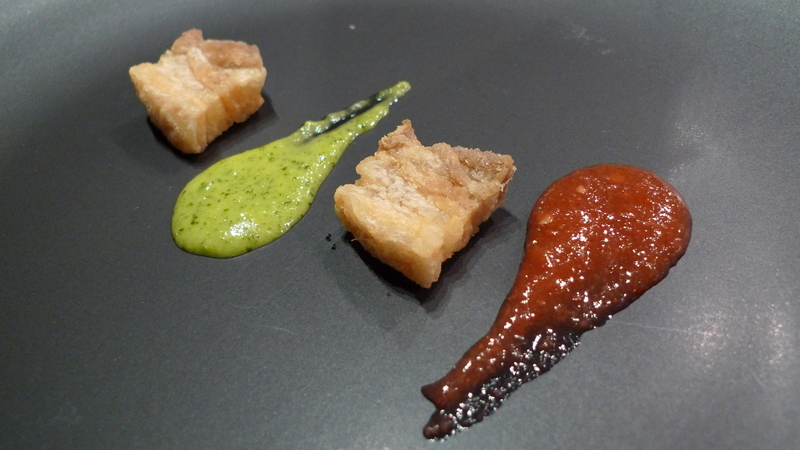 Twice cooked pork belly with a duo of sauces. 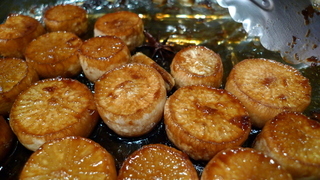 The pork was poached until tender, then sliced and deep fried. The sauces were green chili and cilantro on the left and a rhubarb chili on the right. The sauces turned out nicely, one with a bite of heat and the other with a bite of tanginess. The pork was cooked too early and we kept it warm in a low oven, which dried it out. Would probably sous vide the pork in the future and then slice just before serving. 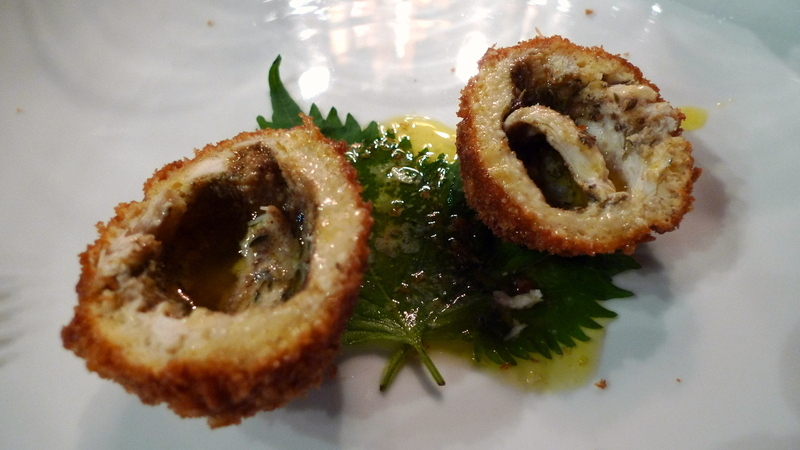 For the chicken course, we prepared a Thai take on chicken Kiev. Chicken breast was pounded thin, sprinkled with curry power and wrapped around a green curry compound butter. 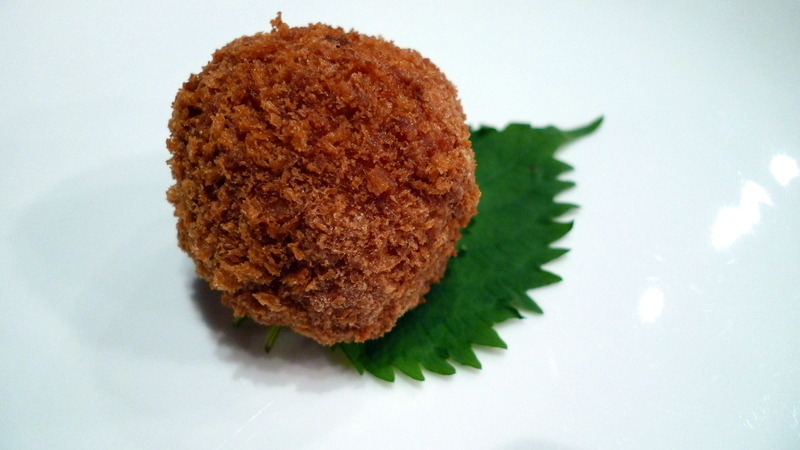 It was then coated in panko crumbs and fried and then served on a shiso leaf. When you cut open the chicken, the butter runs out, leaving a green curry sauce on the inside of the fried chicken breast. It was an interesting dish to eat and tasted good, although a bit buttery. Recognizing a shortage of vegetables on our menu, we prepared a vegetarian course of two types of Thai vegetable blossoms stir fried simply and garnished with an air fried lotus root chip. Very clean and pleasing. 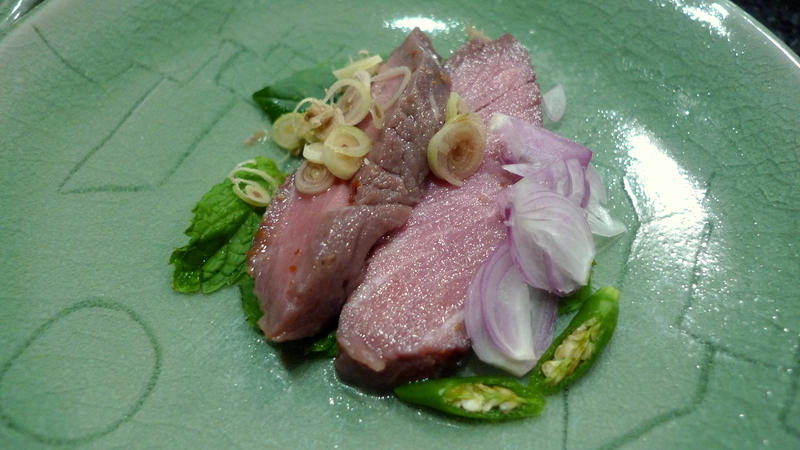 The final main course was a take on nam tok nuea – Thai waterfall beef salad. The beef was cooked sous vide and despite the pink color is completely cooked through. It was meltingly tender, very flavorful, and served with lemongrass, chili, shallots, mint, and a dressing of fish sauce, lime juice, sugar, and chili. Very strong finish to the meal. 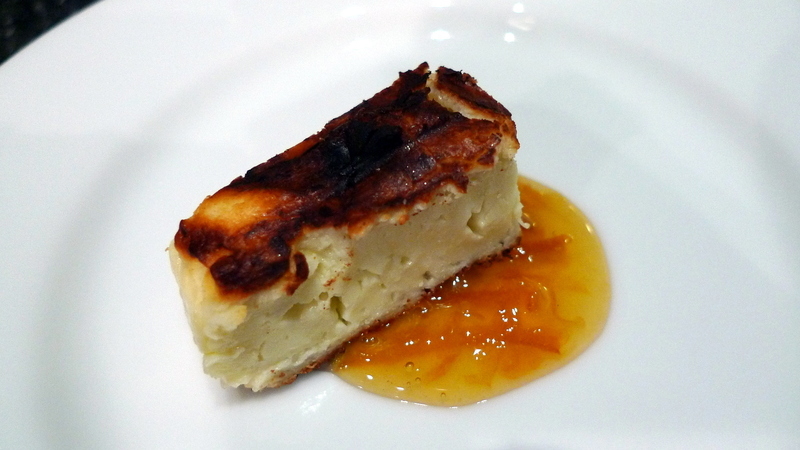 For the cheese course, we served a small slice of halloumi cheese grilled in a panini press and served with royal Bhutanese orange marmalade. Yes, the marmalade actually came from the Bhutanese king’s mother’s royal project. This was a nice combination of textures and flavors. As it came time for dessert, I realized I hadn’t made the sabayon, a thick sauce of egg yolks, sugar, and liqueur. So I ran over to the stove and started to prepare it, absentmindedly putting in whole eggs instead of only yolks, so it took a lot longer to cook and never became as thick as I wanted. 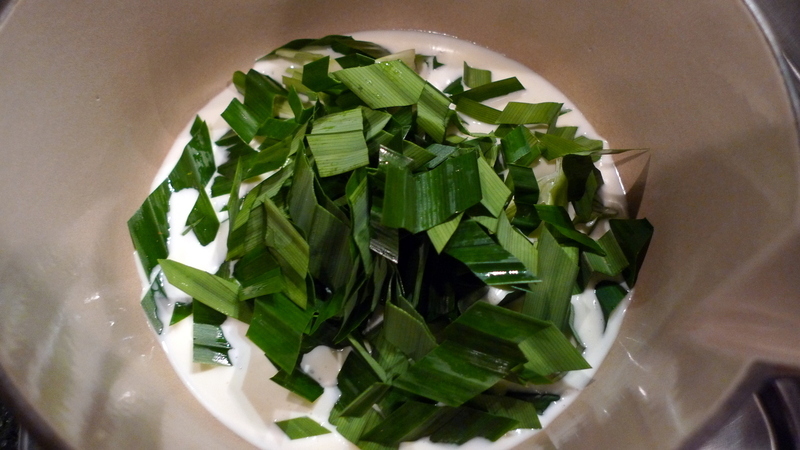 Instead of liqueur, I added the pandan flavored cream that I had prepared some ten hours earlier. It ended up tasting very nice. Uniformed staff pick up desserts for delivery to the dinner guests. 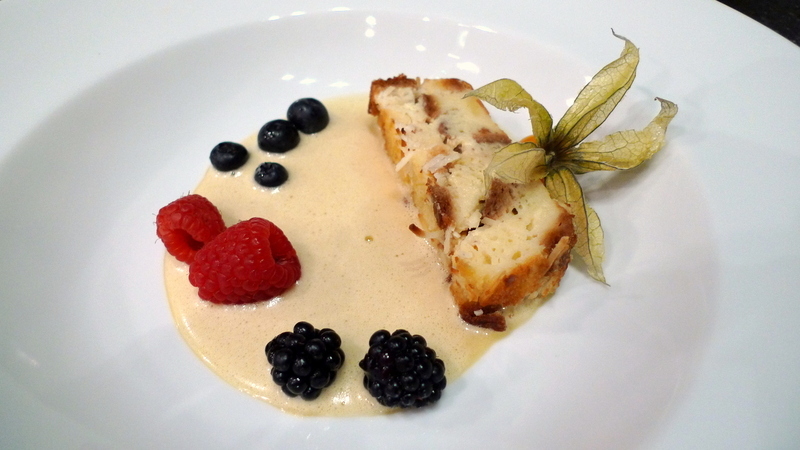 Our dessert, a coconut bread pudding served with pandan leaf sabayon and fresh berries. 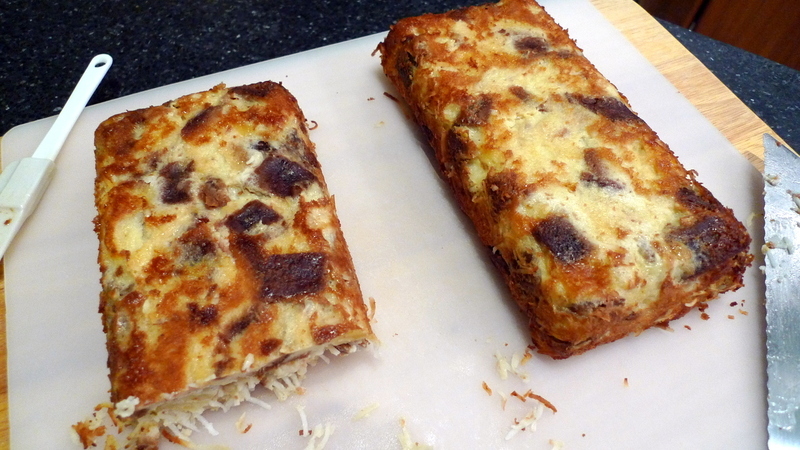 This was really nice, although I would have liked to toast the slices of bread pudding so they had a crisper exterior. All in all, it made for a pleasant conclusion to the meal. As always, this was a lot of fun and a lot of work. It will probably be another year before we attempt it again. At least we have learned some lessons and it seemed a whole lot easier (and actually required less help from Nat’s staff) than our first dinner did. This entry was posted in Uncategorized and tagged Dining, Dinner, food, Multicourse, Nat, plates, small by christao408. Bookmark the permalink. Do I get this kind of treatment when I visit? I want the same treatment (daily) if I visit BKK. This is better than staying at some first class hotel! Seriously… you guys are amazing. I would be exhausted if I did even a couple of courses. Don’t think I’d be up to such a feast. I would feel like the swine contemplating pearls. Wow, Chris — this looks like a magnificent teaser meal! I like the idea of small bites! What a wonderful treat to be served such a wonderful meal in such a wonderful manner. The food looks so good, and your descriptions made me REALLY hungry ! About how much did the supplies cost? I wanna try making some of the foods you made ! After doing this, one appreciates the cost of a tapas or dim sum meal. So much time to prepare, but I do like the idea of being able to enjoy a variety of tastes and textures in a meal. More satisfying, I think, than eating a lot of a few foods. Thanks for sharing. WOW! What a crazy dinner to prepare. I would’ve loved to have been able to sample all those dishes! This looks like an absolutely amazing meal. You’ve got a very lucky group of friends! So glad that it all turned out well for you. @rudyhou – Because your travel was scheduled too late! =P (Thanks for the rec, though…)@Inciteful – Thanks for recommending the post. I assure you, our pearls look a lot fancier in pics than they do in real life. @Grannys_Place – Thanks for the rec and the nice comment. @Wangium – @ElusiveWords – @kunhuo42 – All these comments about visiting, and yet I haven’t received an itinerary. You buy a ticket and then we’ll talk about what I cook for you. =D@mizz_chan – Thanks, I think having friends who appreciate experiences like this makes it all the more worthwhile. @beowulf222 – I have a lot of friends in the restaurant business and I know from them that it is a lot of hard work, day after day, reproducing the same food at the same consistent level. Not sure I’d enjoy that aspect of it. @brooklyn2028 – Would have loved for you to be here to sample it. 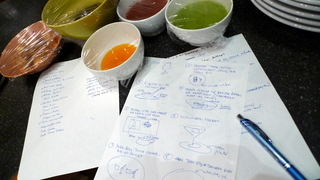 @grannykaren – Thanks for the comment… sadly, we weren’t really using recipes for anything! I think that it started out with an onion or two, a package of frozen spinach, some homemade chicken stock, and some Indian spices. @jandsschultz – There is certainly a lot more effort invovled in creating multiple courses, especially when the plates are more composed and structured rather than just scooped on. @Want2FitIn2Fat2Fit – Thanks for your comment. As for cost, it is a bit hard to say as some of the items were already in Nat’s pantry. I’d estimate that we spent a total of about $300 for fresh food and wine for 12 people. 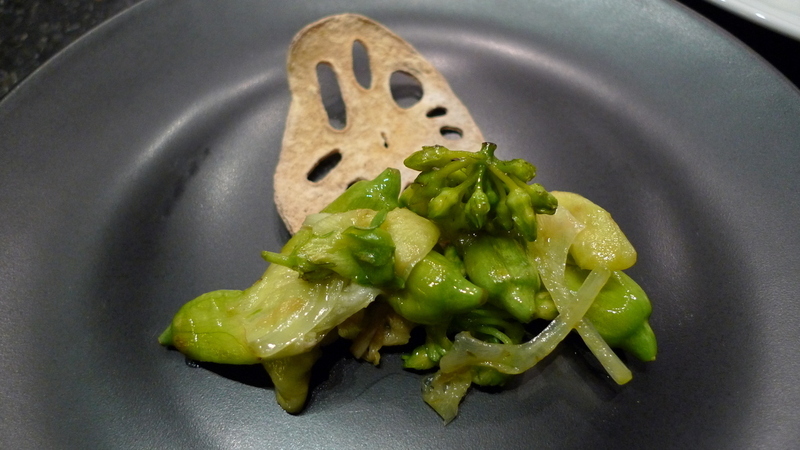 @slmret – @JL789 – Thanks for the kind words; glad you enjoyed the entry. 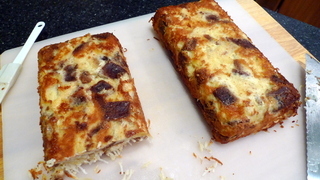 @christao408 – WOW.But I bet it tasted GREAT !